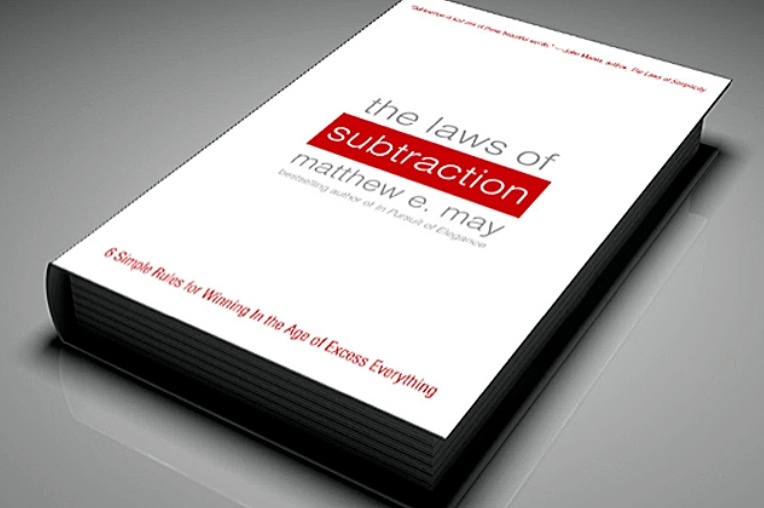 The Laws of Subtraction by Matthew E. May was selected in a book club I recently joined. It's a compelling concept and I would have picked up the book otherwise, but I might not have finished it. The six laws of subtraction that May proposes are designed to help us remove the superfluous because success in the "age of excess everything" demands the skill of subtraction. That piqued my interest, as we really do have unlimited options and distractions and the key is the ability to prioritize and tune out the rest. May compiles more than 50 different stories and perspectives on the topic, resulting in a book more than 200 pages long. I am an easy reader - I love nonfiction and I love new ideas that I can put to use. Unfortunately, I fell asleep twice while attempting to read The Laws of Subtraction. May failed to apply his own methodology to his writing. The stories and metaphors designed to illustrate his laws went well beyond the point. I would have expected a book on the laws of subtraction to be short, concise, and laced with thought-provoking "Aha!" moments. Unfortunately, the gems were buried in lengthy explanations and I truly don't recall any of the specific laws themselves - they weren't catchy and actionable. Pulsing is the concept of working in 90 minute stints with recharging breaks in between, such as a walk, meditation, doodling, or reading. Studies of brain activity show that we move from higher to lower "alertness" every 90 minutes. May points out that the symptoms of pushing the boundaries include restlessness, hunger, drowsiness and loss of focus, which explains why I find myself staring out the window and eating M&Ms. I would add emphasis on the first 90 minutes of the day. What would happen if you invested the best of yourself each day into your highest priorities, with a targeted deadline less than 90 minutes away followed by an enjoyable activity? Sprints result in quick wins that build momentum. We often only think of design when it comes to logos and advertisements, like this FedEx logo. (Do you see the white arrow?) But simplicity and clarity truly are desirable in all our interactions, so why not consider how simple and clear our lives and businesses are designed? I often explain too much, burying my focus in a muddle of words. I also save way too many documents in a pile on my desk, just in case I might one day want to review one. What areas of your organization are cluttered or absorb an inordinate amount of your energy? Do you have white space where a person can relax, create, and work effectively? In the past two years, I have often found myself paralyzed by the sheer number of directions I could go in. We all have a variety of passions, interests, and strengths...which to pursue? May observes that intelligent limitations provide the necessary frame to contain our efforts. Without those purposeful guideposts, we stare at a blank page. Derek Sivers, author of Anything You Want, notes, "Give yourself some intentional restrictions in life and you'll finally get inspired to act. Restrictions will set you free." In what ways can you set better boundaries on your work, your time, and your relationships so that the next step is obvious and builds on the steps that came before? It's more important to listen than to talk. Even a timely wrong decision is better than no decision. Don't halfheartedly wound problems - kill them dead. The implications of the lessons contained in The Laws of Subtraction are open for application to large organizations, small groups, and individuals. Fewer distractions, clear direction, and clean space benefit everyone involved.